We are the first to innovate a "Flatbed Unmanned Airborne Aircraft Carrier" comprise of a wide range of missions capabilities that would intend to enhance airpower capabilities and information capabilities for future military readiness 2035. 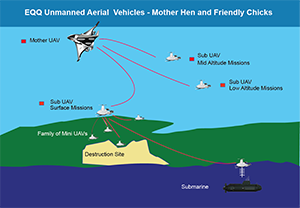 Our vision is to help the Air Force to build a family of unmanned systems into future military combat and noncombat forces.The main goal is to introduce a family of UAVs and interconnected communication and operating platforms that can be incorporated into system-of-systems, providing the ability to integrate all systems into a single force structure. This superior capability would bring requirement to enhance the airpower capabilities for the aim of deterrence that may of help to avoid military conflicts and encourage for peace and security for the future. The EQQ Unmanned Airborne Aircraft Carrier concept was innovated based on 100 years of aircraft industry improvements, and assessing the assumptions of success and failures of these systems. These assessments further analyzed with paying careful attention to the other elements: existing manned and unmanned aircraft systems, mission systems, communications connectivity, accomplishments and shortfalls of those systems, data communications architecture, mission management technology, and technology requirements to enhance Intelligence, Surveillance, and Reconnaissance (ISR) missions capabilities. 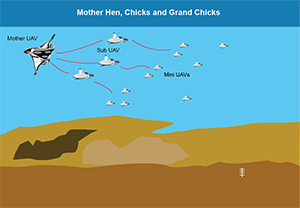 The most significant novel application in this concept is the prospect of developing a family of UAV systems that the large UAV to deploy smaller systems and recover small systems in midair. Also, small UAVs are capable of reaching places manned platforms cannot go. The U.S., NATO and Canada, defense and deterrence strategies could play a significant role in future military readiness to protect and defend challenges posed by anti-access area denial weapons and threats from foreign adversaries. These strategies suggested that the 21st century and beyond need more aggressive military strategy plans that would prevent major wars, in fact, not to start wars. Since deterrence is traditionally focused on conventional and nuclear capabilities, it is crucial that the military must maintain air power superiority and information superiority. These superiorities would strengthen deterrence and defense posture that most needed to defend against all potential threats from adversaries. When it comes to deterrence, it is important to win both air power and information superiority. 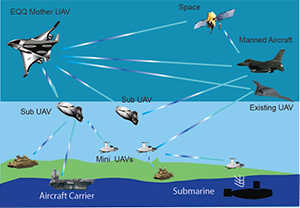 This can achieve by enhancing multi missions operational capabilities in all domains air, sea, ground and space, also by developing uninterrupted airborne intelligence, surveillance, and reconnaissance (ISR) data receiving and transmitting platform. Particularly, to receive and transmit data not only from high-mid and low altitudes but also multiple systems have the ability to communicate with each other and access areas where manned and unmanned systems are unable to go. 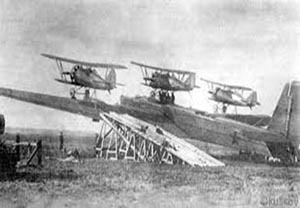 The aviation history demonstrated that between 1917 and after World War II, the United States, Soviet Union, Britain, and Germany expressed their keen interest in experimenting with airborne aircraft carriers in the sky. Particularly, capable of carrying parasite fighter aircraft, with the ability to launch and recover in midair. 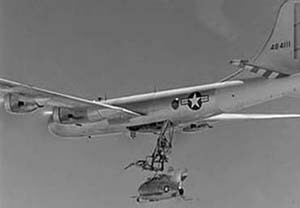 History revealed that these concepts weren't completely successful, especially regarding recovering parasite aircraft back onto the mother aircraft. In fact, these dreams faded almost three-quarter century ago, mainly due to lack of finding an effective solution on recovery capabilities. Nonetheless, the U.S. and other nations continued to remain interested in the airborne aircraft carrier concept. In the early 1970s, the U.S. aerospace industry brought various designs along the line of the original idea, using an existing platform, Boeing 747 jumbo jet as a flying mother aircraft carrier. 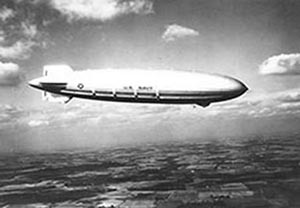 This design was considered basically changing wing layouts and using the early system of belly hatch on a trapeze system. However, this also did not materialize. 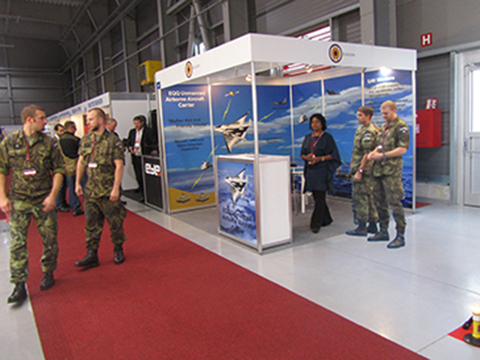 EXHIBITOR: Future Forces conference is a highly recognized international event in the defence & security field organized biennially in Prague Czech Republic. SPEAKER PRESENTATION: The largest and well recognized engineering society in the world that promotes the art, science & practice of multidisciplinary engineering and allied sciences around the globe. EXHIBITOR:At the AUVSI 2013, Washington D.C. conference the IEEE recognized that the EQQ Flatbed Unmanned Aerial System was one of the most interesting concepts. EXHIBITOR: ArcticNet is supported by the Government of Canada, through the Networks of Centers of Excellence program. The key objective of ArcticNet is to contribute to the development and dissemination of the knowledge needed to formulate adaptation strategies and national policies to help Canadians face the impacts and opportunities of Arctic climate change and modernization. PAPER ACCEPTED: AUVSI Israel 2012 accepted our technical paper and provided us an opportunity for an oral presentation on the EQQ Flatbed Unmanned Airborne Aircraft Carrier concept. The conference chaired chaired by the Directorate of Defense Research & Development (DDR&D) of the Israeli Ministry of Defense. EXHIBITOR: Association for Unmanned Vehicle Systems International Washington D.C. - 2011 This association is the world leading organization representing the opinion of the unmanned systems and robotics community. The Association for Unmanned Vehicle Systems International (AUVSI) - 2014 USA. EXHIBITOR:The world's largest organization dedicated to the advancement of unmanned systems and robotics. The AUVSI members work in the defense, civil and commercial markets. 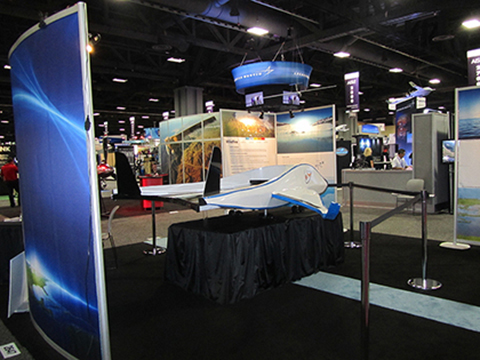 Washington D.C. USA - displayed a model of the EQQ Flatbed Unmanned Aerial Vehicle - 2013. EXHIBITOR: In 2013 AUVSI's Unmanned Systems Conference held in Washington, DC. This convention featured high tech military equipment and new aerospace technologies were displayed by leading industries . PAPER ACCEPTED: International Offshore and Polar Engineering the primary objective is to disseminate scientific knowledge and provide a timely exchange of technical expertise and information. The Annual International Offshore and Polar Engineering (ISOPE), holds one of the worlds largest of its kind with referred scientific papers. EXHIBITOR: AUVSI 2012 was another successful event that we were able to introduce the EQQ Flatbed Unmanned Airborne Carrier concept to the aerospace industry and the military. We received positive comments and built-up a roadmap for future development of our concept. PRESENTATION: For 26 years the International Association of Wildland Fire (IAWF) provides a significant contribution and constant commitment to the global wildland fire community. The IAWF principle objective is to facilitate vital information and promote advance knowledge of wildland fire activities and educate firefighters and the community on wildfire. SPEAKER PRESENTATION: The Unmanned System Canada represents, promotes and facilitates the Canadian unmanned vehicle community to achieve Canadian and worldwide goals. AUVSI 2013 - Washington D.C. In 2013 AUVSI's Unmanned Systems Conference held in Washington, DC. This convention featured high tech military equipment and new aerospace technologies were displayed by leading industries such as Boeing Co., Northrop Grumman, Lockheed Martin, United Technologies, and many other aerospace companies. During this conference, we displayed the Flatbed Unmanned Aerial Vehicle model. At the AUVSI 2013, Washington D.C. conference the IEEE recognized that the EQQ Flatbed Unmanned Aerial System was one of the most interesting concept. 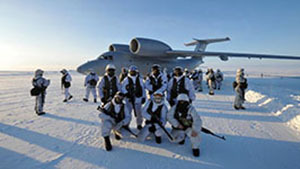 In the Arctic, climate change is bringing an evolving complex security environment, which include, global attention and military activities. In regards to the U.S. and Canada's, defence stand point, the aerospace domain continues to be a challenging issue for the Northern security environment, and missions should be expanded with modernizing plans against possible threats. The EQQ UAS would be designed to enhance Joint Intelligence, Surveillance, and Reconnaissance capabilities to monitor and identify possible threats to both the U.S. and Canadian national security. Deterrence, military strategy is not only relying on the preparation of overwhelming destructive ability against adversaries, and be prepared if deterrence fails and the possibility of nuclear attack, including chemical biological and radiological events. Such preparation must focus on the degree of personal safety of first responders, military personnel and Essential Service personnel so that they have the ability to save public lives and property timely and effectively. To address these related issues, we developed a color-coded identification system under our affiliated company SIGZEEN INTEGRATED SOLUTIONS INC. 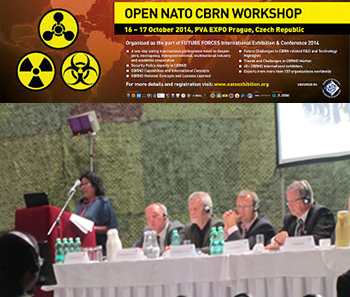 The latest news on global deterrence activities and military readiness.